HIPAA Policies and Procedures Templates Updated with Omnibus Change. One cannot overstate the importance of having and enforcing policies and procedures for complying with the Health Insurance Portability and Accountability Act of 1996 (“HIPAA”). A number of covered entities have paid seven-figure settlements and civil money penalties to the Department of Health and Human Services (“DHHS”) for failing to adopt HIPAA policies and procedures. And having and enforcing policies and procedures can prevent other harm to covered entities and business associates, as well, such as by preventing a breach that would result in as much as seven-or even eight-figure remediation costs or costs other than remediation, such as a damage award against the breaching entity in a lawsuit or bad publicity leading to loss of business. Producing the correct HIPAA compliance policies and procedures is both complex and time consuming, until now. The Complete HIPAA Policies and Procedures Guide, with accompanying CD has over 65 sample HIPAA policies and procedures templates your organization needs to become and remain compliant with the security and privacy rule, all editable in Microsoft Word®. National HIPAA expert and attorney, Jonathan P. Tomes wrote over 65 policies and procedures and a guide on how and when to use them, including a policy matrix defining which are required policies that you must have, addressable policies that you must have if they are reasonable and appropriate, and other policies that are not mentioned in HIPAA but that DHHS may nonetheless consider as being necessary. 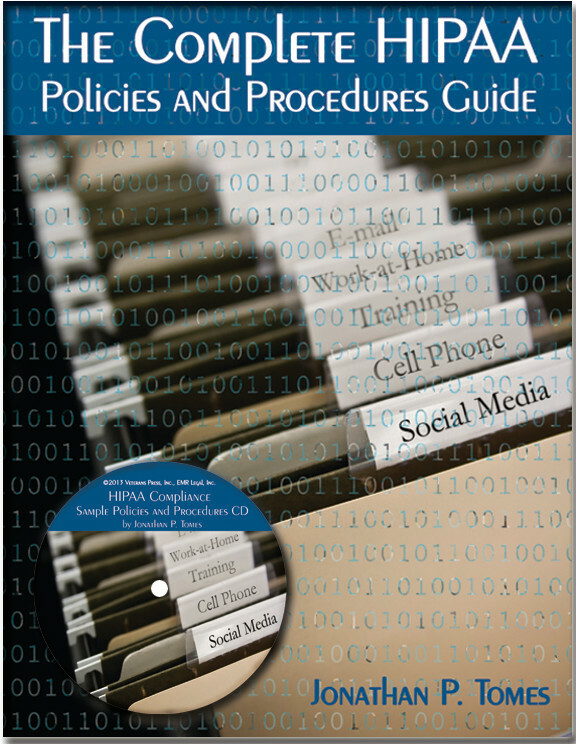 Over 65 HIPAA policies and procedures on CD, editable in Microsoft Word®. Updated to reflect the Omnibus Final Rule requirements. Information about the required retention of policies. Insight that stresses the importance of enforcing policies. Help specifying required contents of policies. How to write a policy. The workforce policy awareness form. A tool to help you develop the policies that you determined you need.